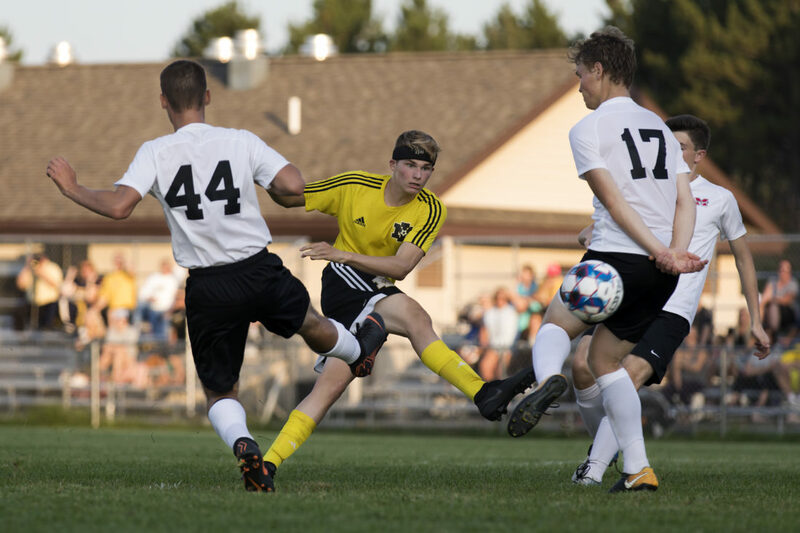 KINGSFORD — Iron Mountain checked Marquette’s speed and edged the Redmen 2-1 in boys soccer Wednesday at Commemorative Field. Adrian Vicenzi’s first varsity goal, a header with 27 minutes left in the second half, was the difference. “We knew that they have a lot of speed and Raffy (Millado) plays up the left side,” said Mountaineers coach Dave Brule, noting his son David had the task of slowing Millado. “We countered with putting David on him to try to neutralize him. He’s got plenty of speed to get behind our defense. Marquette, which blanked Iron Mountain 3-0 late last month, suffered its second loss of the season. Iron Mountain (3-5) got on the board first when senior Jurgen Kleiman found the net 17 minutes into the first half. Marquette’s goal came on a first-half free kick delivered by Drew Wyble, a left-footed bullet that slipped past IM goalkeeper Caleb Bryant. The Mountaineers went into a five-man defensive shell after the first goal. The 2-1 second-half advantage saw nearly the entire IM lineup in front of the goal. “They did a very good job defending their goal tonight,” Menze said. “We had one or two other opportunities but other than that they pretty much shut our offense down. The Mountaineers, who defeated Marinette on Tuesday, showed more than enough energy Wednesday. Iron Mountain had seven shots on goal and Marquette had eight. Liam Jeevar was the second-half goalkeeper for the Redmen. A down side was the Mountaineers’ Owen Caudell suffering a wrist injury that took the senior off the field. He assisted on Kleiman’s goal. Brule celebrated his 50th birthday Wednesday. “This was truly a special birthday present from the kids,” Brule said. Iron Mountain and rival Kingsford will meet Monday at Commemorative Field. Marquette heads to West Branch Ogemaw Heights on Friday and Cadillac on Saturday. The Redmen would like to see the Mountaineers in the UP Tournament on Oct. 13, in Marquette. “Hats off to them,” Menze said. “They played an awesome game.